At the end of Squaduary 2019 week 1 we have a lot of a progress. I know I will have missed a few people from the list below but hopefully they can let me know on this post or Twitter. I am delighted to see so many people joining in already. So week 1 and we have a lot of work from the first week following the pledges from last week. Remember to click on peoples names to jump to those people’s sites. There is a whole lot more on their posts than the snippets I have shown above. Well i have been lucky with time and gotten most of the models painted. Just details to add. But I think I want to get another unit up to this level. First. 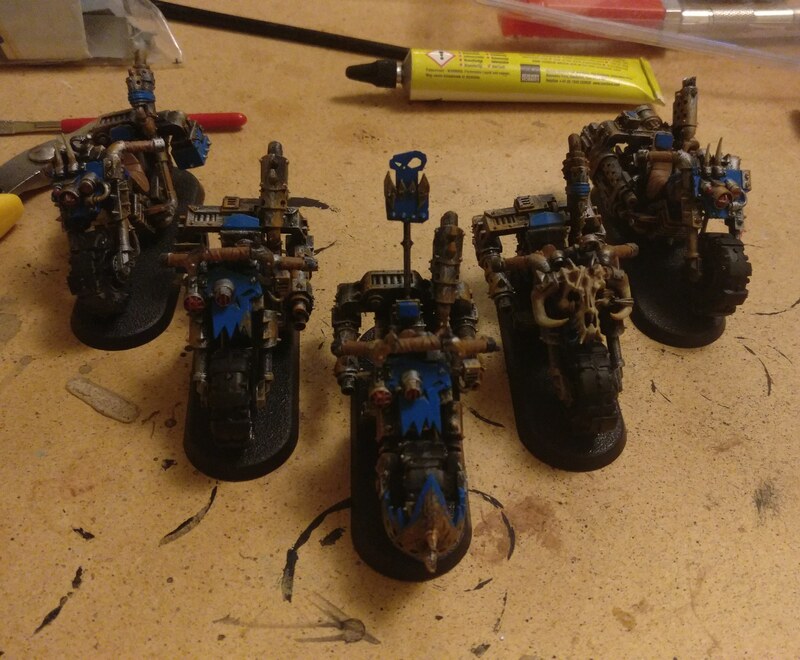 I managed to get a lot of progress done on Warbikers this week. Most of the colours are blocked in now and only some small details remain on them. I have yet to consider the basing on them, but most likely it will be similar to my other Orks. 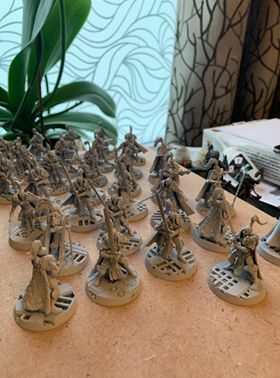 30 sisters built and undercoated, been a busy week with very little opportunities to paint. Hopefully at least a squads’ worth will see some good progress in the coming week. Something new for 1859th Cadian “The Golden Phoenix” a squad of troops that last more than a dice roll in close combat! They’ll be painted in the same yellow & orange lava world camo as my tanks. 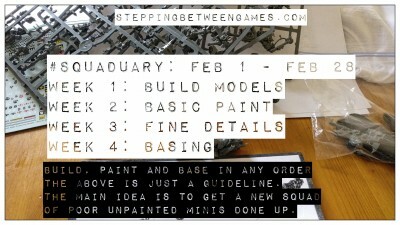 Hoping to go from sprue to based in the month! 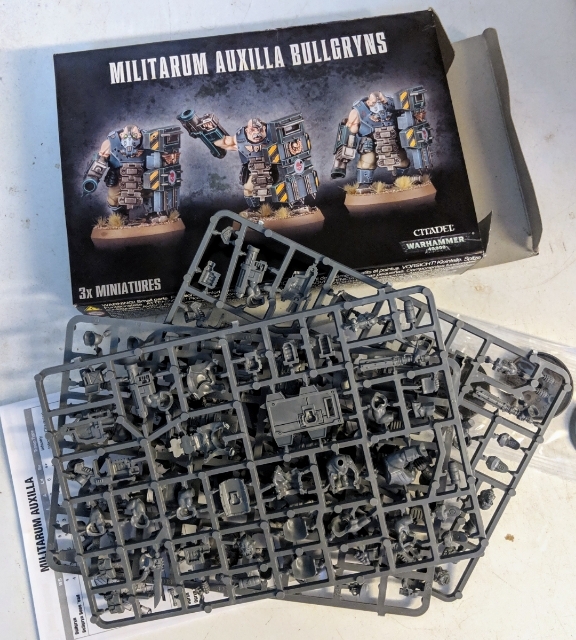 I’m in, running late as always, using this as an excuse to pop out and grab some Tau to build a killteam. May also rope a couple of friends in. th! This is my first year participating. 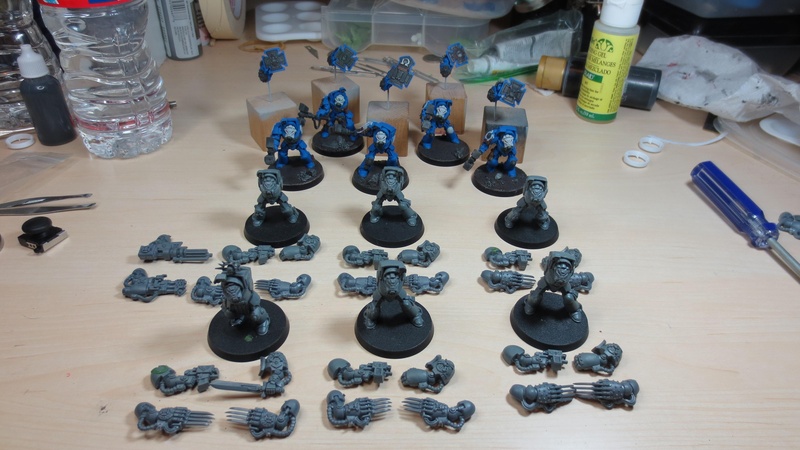 My pledge for Squaduary: Six Ultramarine termies with shooty and assault options. Additionally, to finish their partially-painted THSS brothers in the back. I have my son’s blood angels army to get in shape for his first tourney (given I am not letting him play with grey/the tourney will not allow him to play with grey). I will be making him do a chunk of the work, especially as he has half term this month. I’m working on a 40k Ork Army built around a Stompa. 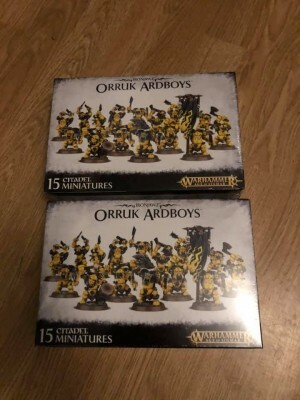 I really dislike the 40k boyz so I’m converting them from the Age of Sigmar Ardboyz. The main part of these will be airbrushing the yellow armour (I’m hoping my new detail airbrush turns up in time!) then painting freehand flames on. 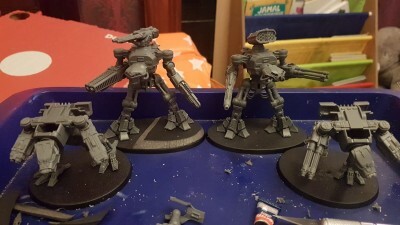 Adeptus Titanicus Venator Light Maniple – Reaver and two Warhound titans of the Legio Fureans (Tiger Eyes). So yellow armour and black flames to play about with. 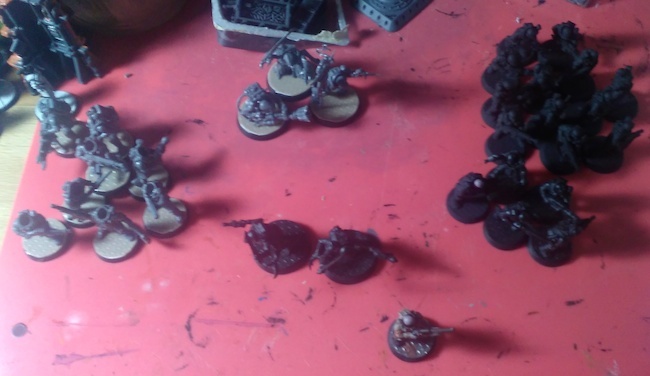 This is half the force – time allowing I’ll double up with the same three models again making a 1500 point force that is for painting rather than gaming. 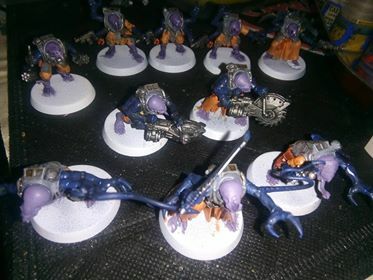 I’m planning to do a 10 man necron warrior squad and 3 necron wraiths. For the progress update. The first one is done, minus basing, and the second one is halfway done. This weekend I cracked on with some building and construction and re-did the helmet of the one completed Vanguard to a brighter red, Mephiston Red and the shoulder/torso armour with Fulgrite Copper washed Agrax. 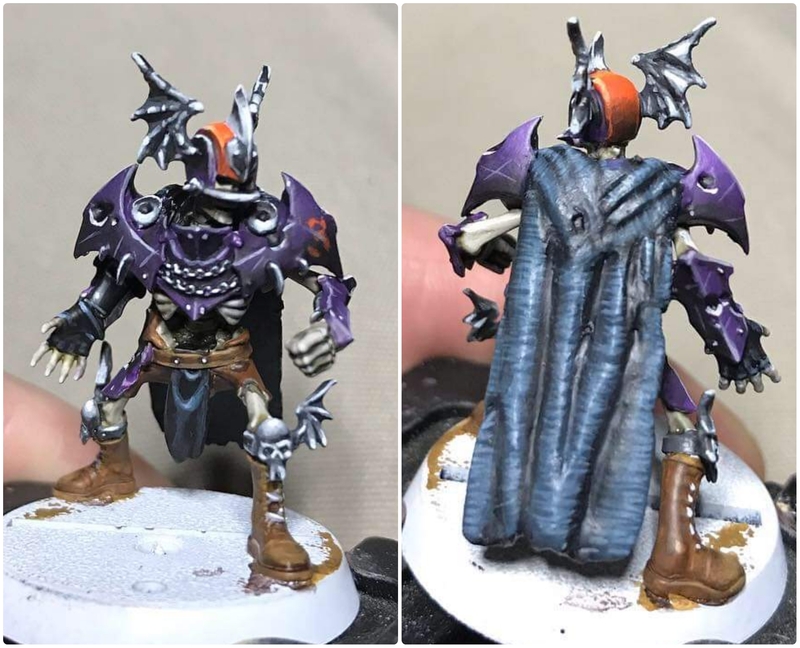 This was so I could match the helmet to the cloak inner and match the torso armour with the paints I have. Time for a week one update. Since I am working with models that were previously built and primed, I got right to the painting. First up, I hit all the left shoulder pads with GW Mephiston Red and GW Calaban Green (where appropriate – for Calabanites!). Sergeants also got red crests. Two of the missile launcher troops were previously painted as I worked on a test scheme for these guys. Some of it stays, some is getting painted over to match my final color scheme. I eventually settled on a bunch of Stealer Cultists for my Cult of the Emperor’s Embrace. I’m not doing it quite properly, due to the difficulties the weather around here makes for priming at this time of year, but it’ll work out basically the same. 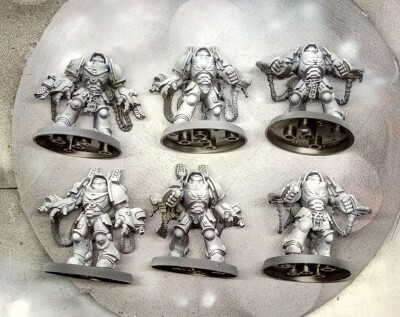 A bunch of my dudes that were on the sprue will be built, a bunch of dudes who were primed will be painted, they’re just not necessarily going to be the same specific dudes. But still, same net result: Fewer dudes on sprue, more painted and game-ready. I actually also forgot to take a pic of the sprues before I built these ones last night, but whatever. Well, one week down and what a week it’s been! 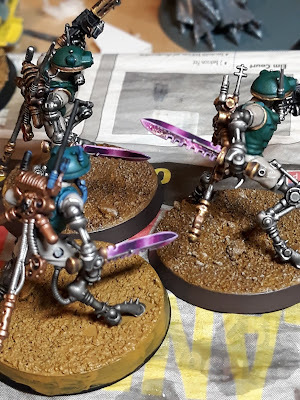 I’ve been making some excellent progress with my Infiltrator squad and have already painted two of them. I’m in. 6 Iron Snakes Centurions (at long last). I will be painting a unit of 10 Heresy Era Assault Marines. Remember to click on peoples names to jump to those people’s sites. There is a whole lot more on their posts than the snippets I have shown above.